Last minute plans to go and eat at one of your favourite restaurants are always awesome! Cafe Mangii is one of my most favourite restaurants to eat in Mumbai. Cafe Mangii simply makes a statement that a combination of a relaxed ambience, good service, perfectly made and presented food with every dish and a great variety on the menu, you just can't go wrong! The one food experience I would recommend at Cafe Mangii is their Poached Pear Salad Entree. 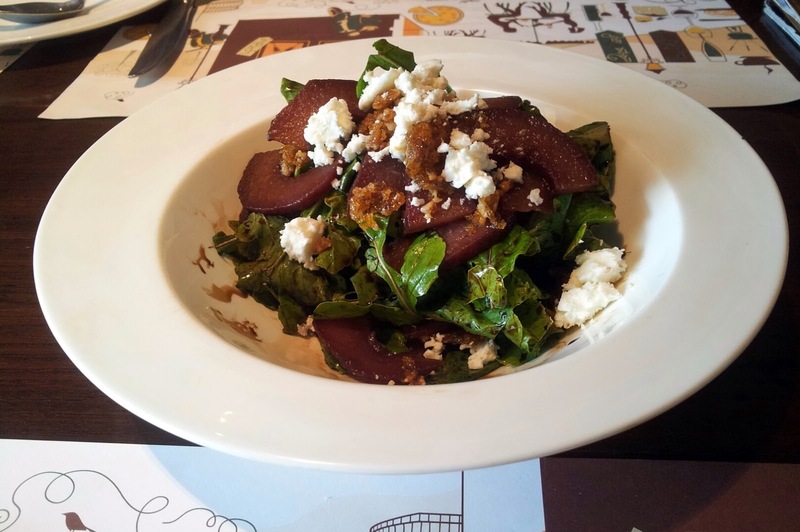 This salad is a great refreshing combination of pears poached in spiced red wine, fresh crispy arugula leaves with creamy crumbled feta brought together by a balsamic reduction dressing topped with caramelised walnuts. There are a variety of flavours: spice and tartness of the pears, the slight fennel-like pungency of the arugula leaves and the distinct flavour of the balsamic reduction, balanced out by the neutrality of the feta cheese with hints of sweetness from the caramelised walnuts . And the texture combination of this dish is just perfect! The crunchiness of the walnuts, the crispiness of the fresh arugula, the softness of the cheese make it a well-rounded dish in terms of textures. The creator of this dish can take a bow! Poached Pear Salad in all it's glory! A disclaimer to this recommendation is that balsamic tends to have a very distinctive flavour that not everyone in India may like. But, of the five people I know who have eaten this salad, four have liked it, so that is a good ratio! For a more detailed review of Cafe Mangii, you can see the Spice Rover's review.